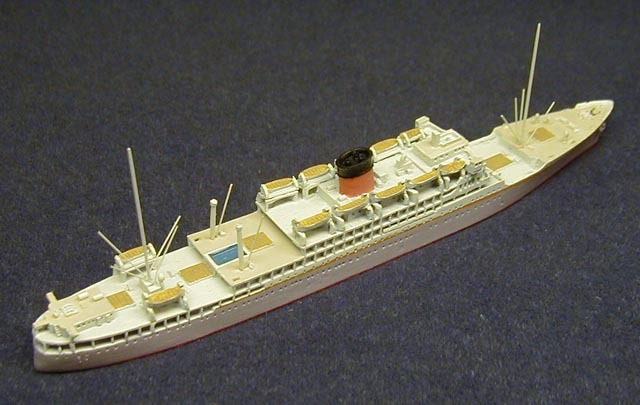 Dimensions: 540 x 72 x 38 ft.
Service: Built for Union-Castle Line (British flag), London-around Africa service. Wartime service as an armed merchant cruiser, then trooping 1939-48. Reconditioned with 105 first and 263 tourist class and resumed around-Africa sailings 1949-58. Sold to Incres Line (Liberian flag), 1958 and renamed Victoria. Totally rebuilt 1959 at Wilton-fijenoord, Rotterdam with length 572 ft, new diesels for 18 knots, and 600 cabin class. U.S. cruising, 1960-75. Sold to Chandris Lines (Greek flag), refitted, 1975-76. Sold to Louis Cruise Lines (Cypriot flag), 1992. Renamed Princesa Victoria, 1993.